There’s something to be said about having tank-top ready shoulders, even in the winter. There's something to be said about having tank-top ready shoulders, even in the winter. That's because having a toned upper body does (way) more for you than meets the eye. Yes, shapely shoulders will give the appearance of a smaller waist, and yes, your arms will look stellar in that cocktail dress. But strengthening this area will also help to relieve pressure from your neck and back, while helping with your overall posture. Basically, toned shoulders are a win-win no matter how you look at it. Now that you're convinced, check out my six-move routine for toned shoulders. Repeat the circuit three times a week to get cocktail-dress ready by New Year's Eve. Stand with your feet shoulder-width apart and your arms at your sides. 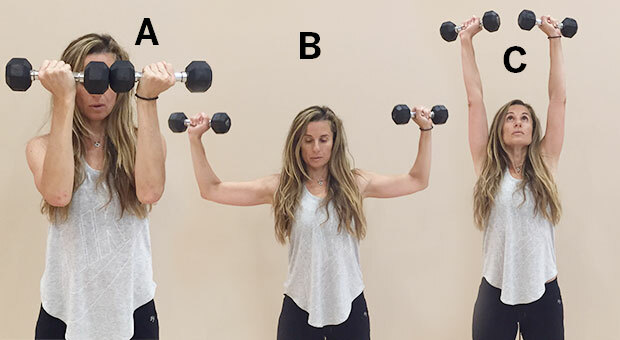 While holding two medium dumbbells, extend your left arm straight out to the side while holding the other dumbbell at a 90 degree angle out to the side of your right ear (A). Continue holding your left arm out while your right arm presses up until it is straight up in the air (B). Bring your right arm back to a 90 degree angle and repeat for 12-15 reps. When you've finished, repeat on the other side. 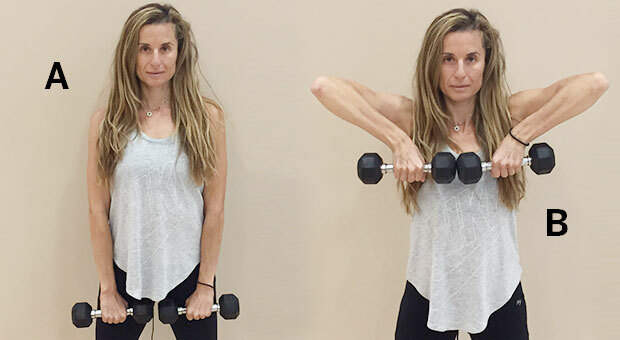 Stand with your feet slightly wider than shoulder-width apart, holding two medium dumbbells. 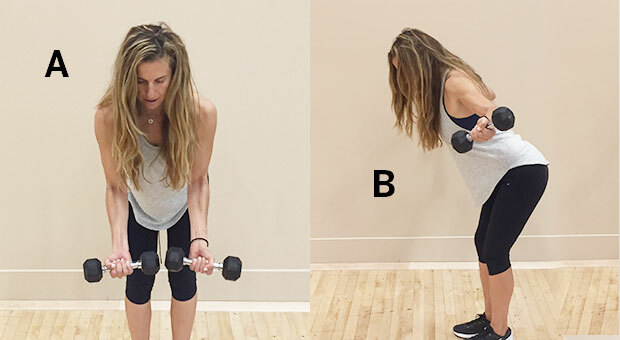 Bring the dumbbells in front of your face with your arms bent and your palms facing you (A). From here, bring both elbows out to the side while rotating your palms so they face outwards. At this point, your arms should be at a 90 degree angle on the outside of your ears (B). Next, press both arms straight up above your head until your arms are straight, but not locked out (C). Release your arms back to the first position and repeat for 12-15 more reps. Grab two medium dumbbells and stand with your feet shoulder-width apart, with your knees bent. Hinge forward slightly from your hips while keeping your back flat. Next, hold the two dumbbells in your hands with your arms bent at about a 45-degree angle and your palms facing you (A). From here, slowly lift your arms as if your thumbs were being pulled towards the ceiling. Stop when your arms are parallel with your shoulders (B)Â and release back to starting position. Repeat for 12-15 reps. Stand about two feet away from a step or bench and place your hands on it so that your fingertips are facing each other (A). Start out with a higher surface for beginners and as you get stronger, you can use a lower surface. Keep your legs straight (but not locked out), back flat, and stand up on your toes. From here, bend your elbows to lower your head toward the bench or step (B). Go as low as you're able to and then press back up to starting position. Repeat this for 8-10 reps. 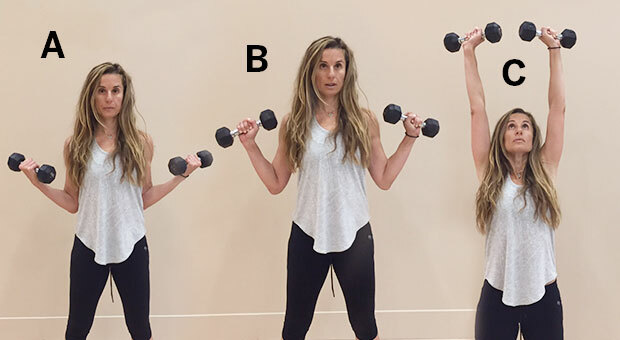 Stand with your feet shoulder-width apart, shoulders back, and holding two dumbbells about an inch in front of your thighs with your palms facing your body (A). While keeping the dumbbells close to your body, raise the dumbbells straight up towards your nose using your shoulders. Stop when your elbows are parallel with your shoulders (B) and release back down. Repeat for 12-15 reps. Stand with your feet shoulder width apart and dumbbells at your sides with your palms facing outwards (A). Perform a bicep curl and then rotate your elbows and hands out to your sides (B). From here, press straight up until your arms are directly overhead (C). Lower down and repeat for 10-12 reps. Looking for more articles like this? Check out 4 Moves for a Toned Back and Upper Body. Jennifer Cohen is a leading fitness authority, TV personality, entrepreneur, and best-selling author of the new book, Strong is the New Skinny. With her signature, straight-talking approach to wellness, Jennifer was the featured trainer on The CW's Shedding for the Wedding, mentoring the contestants to lose hundreds of pounds before their big day, and she appears regularly on NBC's Today Show, Extra, The Doctors, and Good Morning America. Connect with Jennifer on Facebook, Twitter, G+ and on Pinterest.